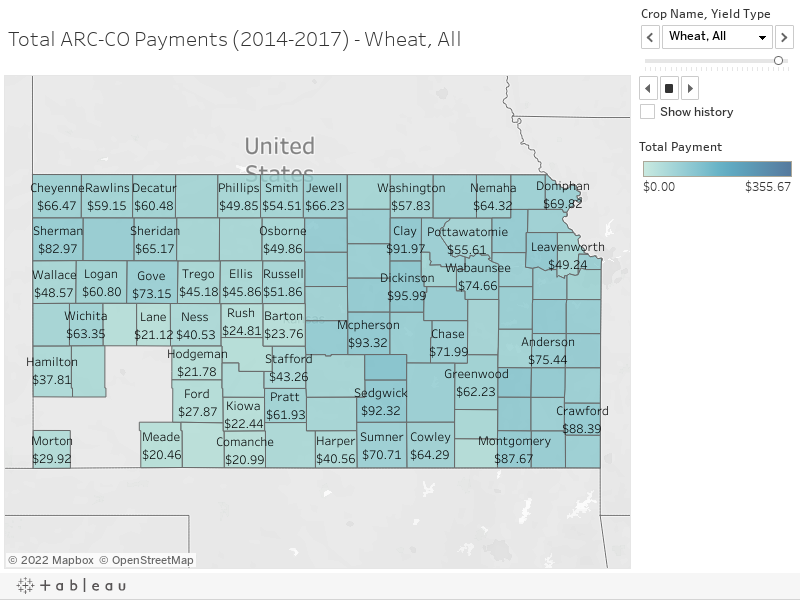 Actual Payments are taken from Farm Service Agency's website HERE They reflect a per acre payment made on payment acres (85% of base acres in that commodity). Sequestration is not included. Click "Full Screen" in the lower right to see a larger version of the map. Hover your cursor over the county of interest to see more detail. Use the dropdown menu on the right side of the map to select your Crop and Yield Type. Use the controls in the upper left side of the map to zoom in or out, center the material of interest or to select a certain area of the map. Questions may be directed to Robin Reid, 785.532.0964 or robinreid@ksu.edu; Art Barnaby: barnaby@ksu.edu; or Rich Llewelyn:rvl@ksu.edu.